Vac-Tron Equipment has gone one step further in the cleanup process by developing a perfect solution to micro trenching using a specialized in tank filter (patent pending) inside the vacuum excavation unit’s debris tank. This in tank filter eliminates the need to add water to the micro trenching process and eliminates excessive material from reaching the cyclone separator. By using this filter, it will reduce the cleanup time during the trench run because there will be no need to stop and cleanout the cyclone or unclog the exit hose from debris tank due to caked material. Ultimately this will increase overall efficiency onsite. 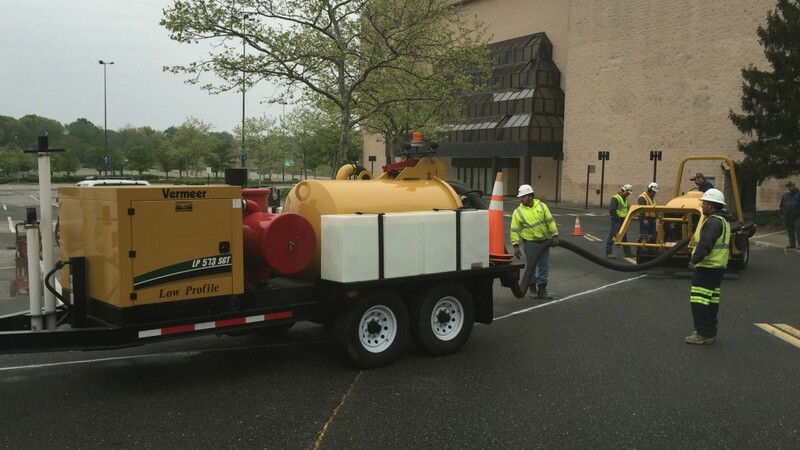 David Donohue of Vermeer Mid Atlantic says "The Vac-Tron LP 573 SGT is the ideal vacuum for micro trenching, the high cfm's and low noise output made communication and productivity simple." David and Pfeiffer Enterprise Inc were demonstrating Vermeer's micro trenching equipment and Vac-Tron's LP SGT high cfm unit in Glen Bernie, MD in this photo.